If there are two things my kids could probably eat everyday it would be ice cream and cake. Go figure, that’s kind of a default with kids I have of their age. They literally ask for ice cream every single day, no joke. My default answers are ‘have I ever said no’, and ”. Yes, an empty response meaning please figure it out kids as I am tired of saying ‘sure, I don’t care’. So while I was in the hospital I was thinking of things I could do to occupy my daughter so that I could try to keep her busy, while at the same time try to reserve energy during those early stages. That’s when I rummaged through the pantry, saw a box of cake mix, and decided that I would come up with some ice cream sandwiches for them to devour. These are super easy to make, and are a great ice cream snack to satisfy most any kid. 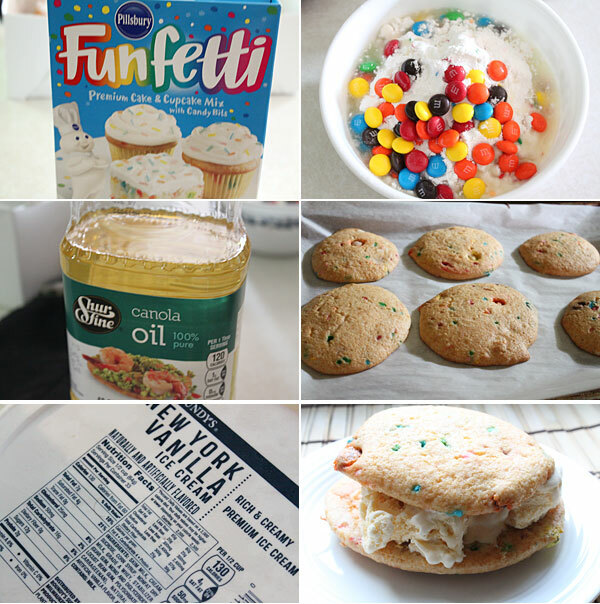 Start by mixing the cake mix with the M&Ms and oil making it into a nice batter. Take ice cream scoop sized portions of the batter and lay onto the cookie sheet, leaving a couple of inches in between each scoop. Place into the preheated oven and cook for about 12 minutes or until they are evenly cooked. Once the cookies are evenly cooked, remove them from the oven and let them cool on the parchment paper. Once cooled, place into the refrigerator for about 30 minutes or so until they firm up. Once firmed, remove from the freezer, and get out the ice cream. 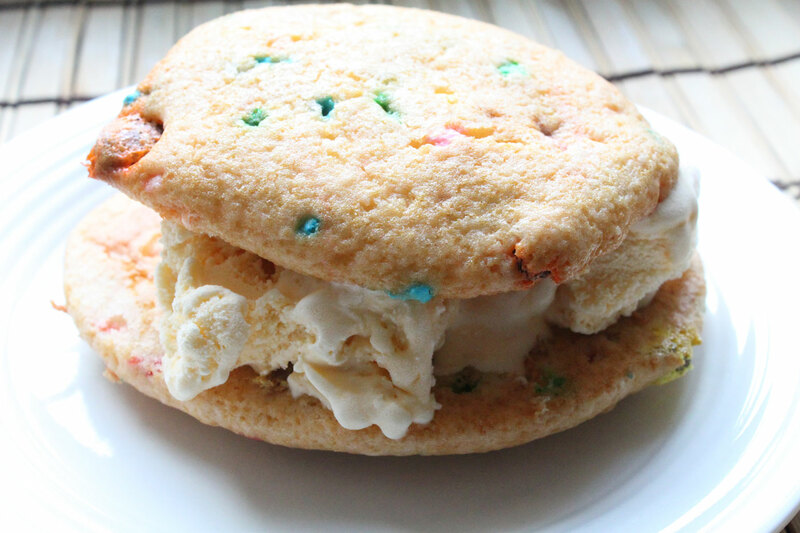 Take one of the cake cookies and add a scoop or two of ice cream, then top with the other cake cookie. Repeat with remaining ice cream and cookies. I like to wrap mine with a bit of parchment for future use, but trust me these will not last long once they come into sight from one of your kids. Unwrap and dig in. Cool, refreshing, and fun(fetti) all around. These kept my kids relatively quiet, yet extremely happy, and what parent doesn’t love that! If you are looking for an easy dessert that will please any kid (or adult), give these a try. Hope you enjoy!